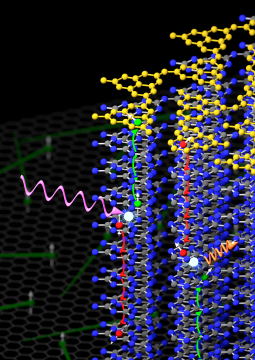 Polymeric carbon nitride is an organic material with interesting optoelectronic properties. As an inexpensive photocatalyst, it can be used to facilitate water splitting using sunlight. Joint research by Helmholtz-Zentrum Berlin, the University of Rostock, and Freie Universität Berlin as well as other partners has now investigated for the first time how light creates charge carriers in this class of materials and established details about charge mobility and lifetimes. They discovered surprising characteristics in their investigations that provide prospects for new applications, in conjunction with graphene for example. HZB researchers have developed a new semiconducting structure, which uses sunlight to split water and produce hydrogen. It is made from a substrate of Chalcopyrite, coated with Titaniumdioxide, both inexpensive materials. See, how this structure is produced. The research is embedded in the program Light2hydrogen, sponsored by the German Ministry for Education and Research (BMBF).